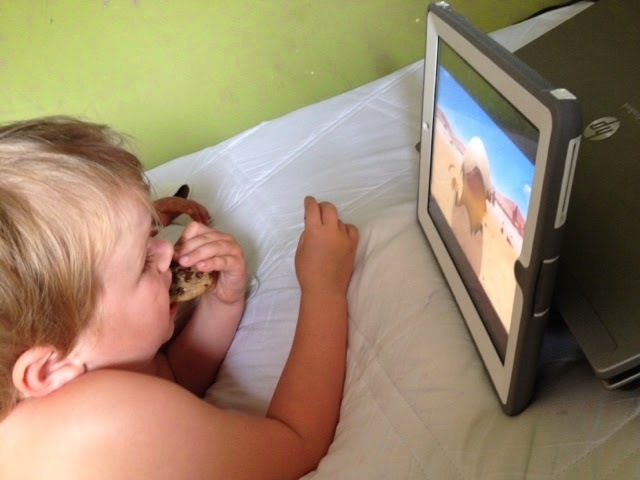 This morning Jonah had 2 tonic clonic (grand mal) seizures in his sleep. It was hard after going so long seizure free. The rest of the day he did great. 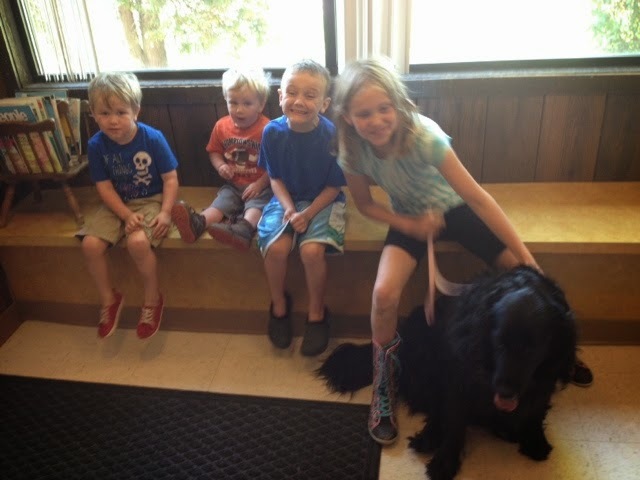 We talked to his doctor and his levels look good so nothing will change as of now. We are having a hard time getting insurance to authorize the IVIg infusion by Wednesday locally so I may have to take him down to the Mayo to get it Thursday morning. His doctor does not want him to wait until next week. Please be praying it will work out locally. Justin, Tyler and Shane leave for Indianapolis on Wednesday and won't be back until Monday. That will be a long stretch by myself with the 4 littles. The trip has been planned for a long time and if they don't go Shane misses out on the $750 coming to him for doing so well during the regular season. Justin and Tyler will also miss out on a chance to get a world invite. Besides this morning it has been such joy watching Jonah run around and play like a normal 4 year old. My prayer is that he will remain seizure free. At least not have multiple everyday. 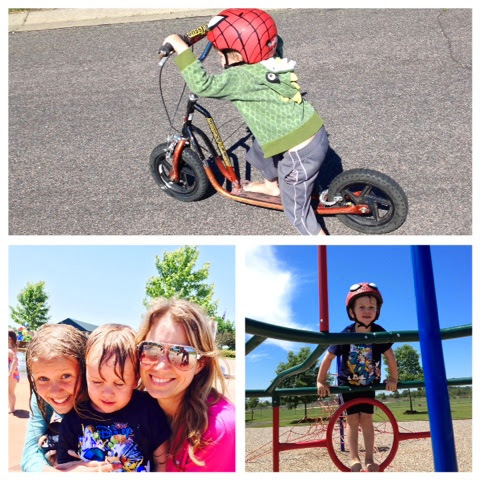 Jonah went from having multiple seizures everyday to not one seizure in a whole week. That is our miracle. Some days he would only have a handful and other days hundreds. Even having only 7-8 seizure a day was hard on all of us. 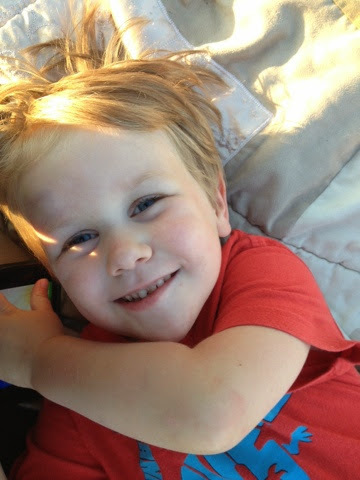 For Jonah, he would often fall over from a drop seizure and cut his lip or bruise his face. It was vary stressful. We couldn't leave him alone for any amount of time. 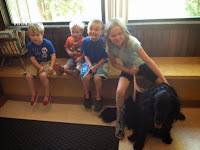 Between the 3 older kids and us we were constantly following Jonah around to try to keep him safe. Then 3 weeks ago hit. Things went down hill for Jonah fast. He started having way more seizures. He was having them to the point where they couldn't tell when he would come out of one and a new one would start. That's when all the medication was introduced. Still he wouldn't stop seizing. Finally, the Sunday we were in the hospital we got a glimpse of hope. Jonah came back to us for a short while. It was an amazing time to see him interacting with us. After about on hour or so he pretty much went back into his seizing state. Still more med increases and the start of IVIg. Then by Tuesday afternoon we had our Jonah back. 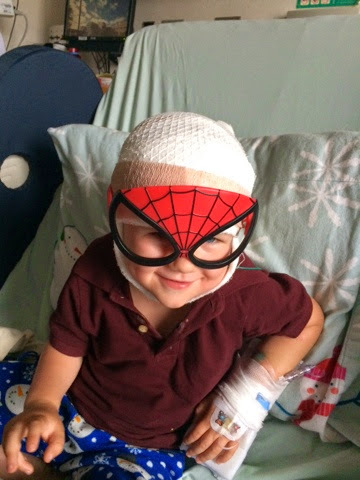 He was playing cars, riding around the hospital on big wheels and so much more. He was still having tonic seizures mostly in his sleep which was new to us. Then, that Wednesday night he had his last known seizure. Jonah has been seizure free for 1 week! He has not gone a week completely seizure free in over a year. Praise God! It's hard not to worry, to think the second I start celebrating he will have a seizure. But I know I can't live like that. I need to enjoy each moment with Jonah and all of the KB kids. It was wonderful to see the rest of my family yesterday. Jonah was also so happy to be home. The first thing he did was get out every riding toy out of our garage and test them all out. I am so thankful that we have our boy back. Even if he does talk a little different or has a few side effects from the medications he's on. To see him happy and running around is more than words can say. I can't say thank you enough for all of your continued support during this difficult time. 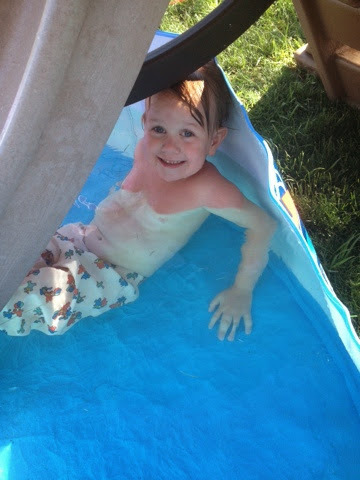 I can't explain the terrible feeling when your very smart 3 year old who has passed if not exceeded all of the developmental milestones suddenly starts having seizure after seizure until the seizures just won't stop. Then your child stops talking and literally can't talk or walk or tell us when he has to go to the bathroom so he just goes because he can't tell anyone. 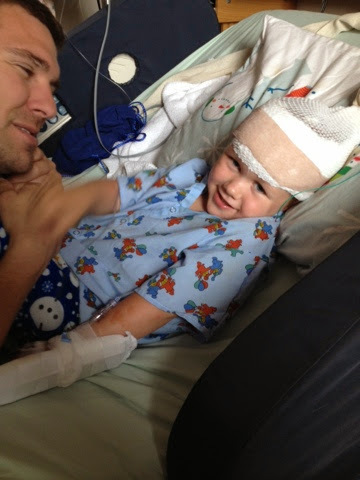 His EEG was so bad they couldn't tell when his seizures stopped and new ones started. Then to watch the doctors give him medication after medication while you sit there helplessly and watch his hand shake from the mediation or him hating having wires on his head or an IV in his arm. It is so hard to sit around and trust the doctors, as someone else said, hope they care as much as you do. It's hard to let go and let God be in control. I'm not sure at this point what is working if it be the increased Keppra, maxed out Depakote, the ketogenic diet or the IVIg. But Jonah hasn't has a seizure, not even one in 2 days. Praise God for that! Often with Jonah's syndrome kids have what they call honeymoon phases where they change a medication or something and have great seizure control for a few weeks or so then the start going back down hill. 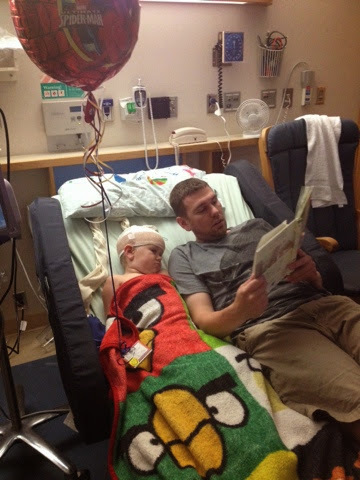 It really blows me away that people care so much about Jonah and our family that they would reach out and offer to mow our lawn, make Jonah his special meals or visit us at the hospital 2 hours away, open their house for us, donate on our blog so we can make sure Jonah is taken care of, praying for us, making birthday cards, taking care of our other kids, cleaning.. It has been a long 8 days. Tonight we finally get to go home and reunite with the rest of our family. This afternoon Jonah is having his last, at least for 2 weeks, infusion at the hospital. We are OUT of the hospital. Praise God!! 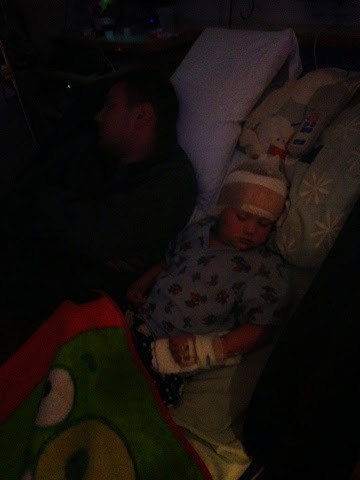 Jonah was discharged tonight around 8pm. He will need to come back for the next 2 days to have infusions so we will stay down here until Friday evening. But it is nice to be out of the hospital. The main seizures Jonah has been having today anyway are tonics. Not to be confused with tonic clonics. It's a stiffening of his body and his arms come up and eyes open. It is scary to watch but at least he's sleeping. First and foremost thank you everyone for your prayers. We are feeling them. I know so many people from individuals to families to small groups to entire Church services having been praying for our Jonah. It is very humbling that so many people care about our little boy. Jonah will be 4 this Sunday. I think his first birthday present was getting all of those wires off of his head so he could get off of his hospital bed. So we are getting discharged tomorrow. 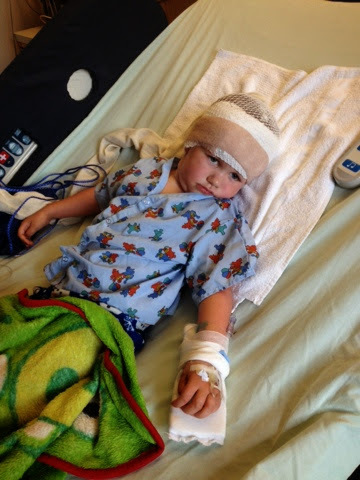 The doctors say that his EEG has improved but is still bad. They know what they want I guess and are letting is go. He is not in status mode anymore having seizures back to back which is good. He is still having more though than 2 weeks ago. He has to be watched 100% of the time. He seems to be tolerating IVIg well so far. Thank you to those who donate blood. IVIg is an infusion of protein in plasma from over 1000 blood donors. Because of people who donate others like Jonah can have these infusions. It is sad to see the cognitive and speech decline from the Depakote. We will need to stick around Rochester until Friday though because he has an infusion here at the hospital each day through Friday. Thanks for all of your prayers and support. 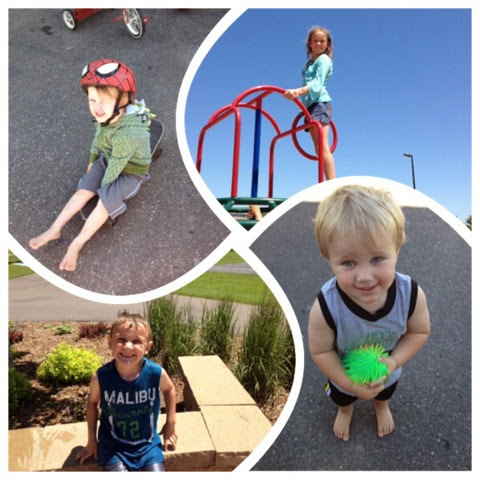 Yesterday afternoon was great to even get part of our little Jonah back for awhile. Although he can still communicate with us now he is still having seizures and seems pretty drugged out from all of the medications he is on. Thank you for your thoughts and prayers we are feeling them. A lot of things seem to be falling into place that can only be a God thing. The neurologist's of the day just came through and said although Jonah is showing improvement visually (clinically) his EEG isn't getting a ton better. So they are suggesting that we go the route of starting the IVIG (intravenous immuno globulin) and that will take 5 days. So we are looking at what to do now, as that will bring us to Friday, and even at that point depending on how things look we may not be able to go home. Please pray that we will make wise choices with our other children and my work and so on. Yesterday I was a bit bummed to say the least. Our aunt and uncle came down to bring us clothes and dinner and hang for a bit, which was very appreciated as we got to talk for a bit and even joke around. I prayed over and over and over again for God to heal Jonah and allow us to have him back again. Yesterday was Father's Day, and I wasn't feeling like a great father as I am not really able to do much about what is going on with Jonah. (Satin's lies, I know) Nevertheless, I was blown away at 4PM Jonah got 750mg of Keppra and it was just what he needed. Hear me out he wasn't back to new, but he was back to talk with us, joke around and be much like himself that we have grown to love so much. He almost ate his entire meal by himself, which is amazing. We snuggled and talked a bit and it was just good to hear him say good night and that he loves me too. We had a glimpse of hope today with Jonah. Although nowhere near the Jonah we know and can't wait to have back. Jonah talked to us today. Jonah smiled at us today. Jonah was able to eat some of his food. His doctor surprised us today with a visit. It's pretty rare for a doctor to show up at the hospital on a Sunday morning just to see Jonah. We met with her to go over the game plan. Although his non convulsive status seizures were not damaging to him the doctor want to be more aggressive with getting him out of it. He had been in an almost constant seizure mode since he woke up Friday morning. the dose of the new medication. That didn't really do much. So we went on to the next thing which was to increase his old medication by tripling the dose he was getting. That is when he started talking a little and becoming more aware I his surroundings. He is still not anywhere near his baseline it was so good to hear his sweet voice. Jonah is still having seizures so the next step is to have a meeting tomorrow with his doctor and her team and discuss giving him IVIG or steroids. Not much has changed today for Jonah. His language skills have actually gotten worse. I don't think he said more than a handful of slurred words if that. At one time tonight it seamed as if he was trying to talk but couldn't. It is so sad to see him like this. The doctor was here till 10pm tonight monitoring and working on Jonah's case. For anyone new here Jonah has a very rare form of epilepsy called Doose Syndrome. I'm very tired and it's 12:30am so I'm going to make this one really short. 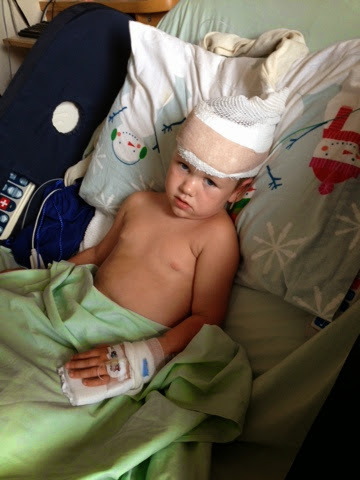 When we arrived at the Mayo they gave Jonah a different kind of rescue med to try to break him from having seizures. That didn't really work. That was on top of the rescue med we had already given him at home that also didn't work. Next they gave him a big IV dose of Depakote which is a pretty heavy anti seizure drug. They have given him Depakote 3 times so far. He slept peacefully for awhile. When we woke up he started having seizures again. He talks very little and just kinda lays around. He played the iPad for awhile which was nice to see. I guess we will be here until at the minimum, Sunday. As for Vanessa, I think she's starting to feel better. Please keep our daughter in your thoughts and prayers. She has been having bad stomach pain for the last few days. She has been in bed and is not been eating. I am going to try to get her in to see the doctor today and will pot an update later. Thanks. A lot has happened since my last post. Jonah seems to have taken a turn for the worse. Almost daily he has been going into non-conclusive status epilepticus. 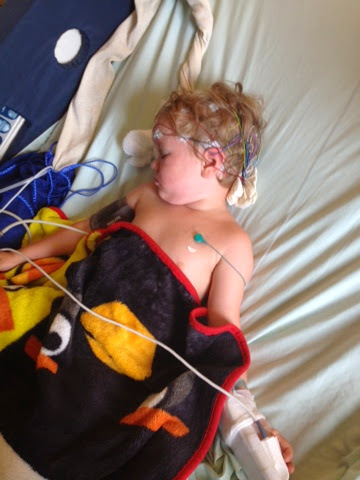 Which is basically him having on and off seizures that last for hours looping in and out of seizures. We need to break the cycle by giving him a dose of rescue meds which puts him in a drunk state for an hour or so then back to normal. The more we give him the rescue meds the greater chance it will become less effective or he will become dependent on it to break seizures. Today he actually had what we believe to be 2 of them. Thankfully, he fell asleep early and is still resting peacefully. We are only allowed to give him rescue meds twice per day and no sooner than 12 hours in between. So, I was feeling a little nervous before he fell asleep. 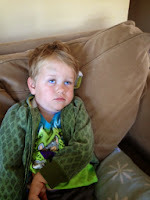 Another thing that has been going on is that Jonah has been having increased tonic clonic aka grand mal seizures. Today he had 3. We have been talking to the nurse/doctor at the Mayo and try would like to see him in the monitoring unit tomorrow. We are not sure if they can get us in yet until tomorrow morning. Thanks for your continued prayers support! Sorry it has been so long since an update. I have so much to share. I only have a minute so I will share today's events. The morning started with Jonah waking up about 7:30am and going right into a seizure state. He would go in and out of it so I wasn't sure if I was suppose to give him his emergency meds or not. So Justin ended coming home from work early at about 12:30. It was very stressful. 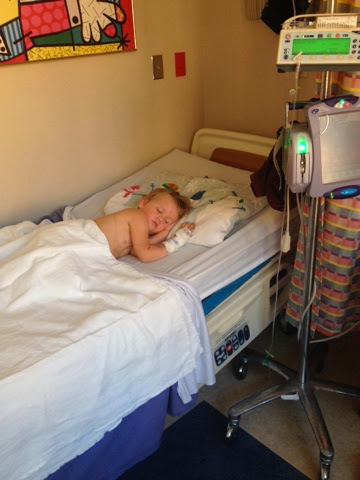 It was his first non-convulsive status epilepticus which is basically a prolonged seizure or cluster of seizures. His went on from 7:30am to 2:30pm. We had increased his meds 5 days before which i think caused this. We have decreased the meds since then. We have hired this diet specialist. She seems great! We start new meals soon.